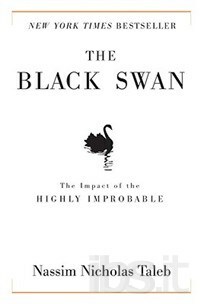 The Black Swan: The Impact of the Highly Improbable is a 2007 book by author and former options trader Nassim Nicholas Taleb. The book focuses on the extreme impact of rare and unpredictable outlier events — and the human tendency to find simplistic explanations for these events, retrospectively. Taleb calls this the Black Swan theory. The book covers subjects relating to knowledge, aesthetics, as well as ways of life, and uses elements of fiction and anecdotes from the author's life to elaborate his theories. The book spent 36 weeks on the New York Times best-seller list. The book is part of Taleb's five volume series, titled the Incerto including Fooled by Randomness (2001), The Black Swan (2007–2010), The Bed of Procrustes (2010–2016), Antifragile (2012), and Skin in the Game (2018). A central idea in Taleb's book is not to attempt to predict Black Swan events, but to build robustness to negative events and an ability to exploit positive events. Taleb contends that banks and trading firms are vulnerable to hazardous Black Swan events and are exposed to losses beyond those predicted by their defective financial models. The book asserts that a "Black Swan" event depends on the observer, e.g., what may be a Black Swan surprise for a turkey is not a Black Swan surprise for its butcher. Hence the objective should be to "avoid being the turkey", by identifying areas of vulnerability in order to "turn the Black Swans white". Taleb refers to the book variously as an essay or a narrative with one single idea: "our blindness with respect to randomness, particularly large deviations." The book's layout follows "a simple logic", moving from literary subjects in the beginning to scientific and mathematical subjects in the later portions. Part One and the beginning of Part Two delve into psychology. Taleb addresses science and business in the latter half of Part Two and Part Three. Part Four contains advice on how to approach the world in the face of uncertainty and still enjoy life. Taleb acknowledges a contradiction in the book. He uses an exact metaphor, the Black Swan idea to argue against the "unknown, the abstract, and imprecise uncertain—white ravens, pink elephants, or evaporating denizens of a remote planet orbiting Tau Ceti." There is a contradiction; this book is a story, and I prefer to use stories and vignettes to illustrate our gullibility about stories and our preference for the dangerous compression of narratives.... You need a story to displace a story. Metaphors and stories are far more potent (alas) than ideas; they are also easier to remember and more fun to read. In the first chapter, the Black Swan theory is first discussed in relation to Taleb's coming of age in the Levant. The author then elucidates his approach to historical analysis. He describes history as opaque, essentially a black box of cause and effect. One sees events go in and events go out, but one has no way of determining which produced what effect. Taleb argues this is due to The Triplet of Opacity. The second chapter discusses a neuroscientist named Yevgenia Nikolayevna Krasnova and her book A Story of Recursion. She published her book on the web and was discovered by a small publishing company; they published her unedited work and the book became an international bestseller. The small publishing firm became a big corporation, and Yevgenia became famous. This incident is described as a Black Swan event. The book goes on to admit that the so-called author is a work of fiction. Yevgenia rejects the distinction between fiction and nonfiction. She also hates the very idea of forcing things into well defined "categories", holding that the world generally is complex and not easy to define. Though female, the character is based, in part, autobiographically on the author (according to Taleb), who has many of the same traits. The third chapter introduces the concepts of Extremistan and Mediocristan. He uses them as guides to define how predictable the environment one's studying is. Mediocristan environments safely can use Gaussian distribution. In Extremistan environments, a Gaussian distribution should be used at one's own peril. In chapter nine, Taleb outlines the multiple topics he previously has described and connects them as a single basic idea. In chapter thirteen, the book discusses what can be done regarding epistemic arrogance. He recommends avoiding unnecessary dependence on large-scale harmful predictions, while being less cautious with smaller matters, such as going to a picnic. He makes a distinction between the American cultural perception of failure versus European and Asian stigma and embarrassment regarding failure: the latter is more tolerable for people taking small risks. He also describes the "barbell strategy" for investment he used as a trader, which consists in avoiding medium risk investments and putting 85–90% of money in the safest instruments available and the remaining 10–15% on extremely speculative bets. The term black swan was a Latin expression: its oldest reference is in the poet Juvenal's expression that "a good person is as rare as a black swan" ("rara avis in terris nigroque simillima cygno", 6.165). It was a common expression in 16th century London, as a statement that describes impossibility, deriving from the old world presumption that 'all swans must be white', because all historical records of swans reported that they had white feathers. Thus, the black swan is an oft cited reference in philosophical discussions of the improbable. Aristotle's "Prior Analytics" is the most likely original reference that makes use of example syllogisms involving the predicates "white", "black", and "swan." More specifically, Aristotle uses the white swan as an example of necessary relations and the black swan as improbable. This example may be used to demonstrate either deductive or inductive reasoning; however, neither form of reasoning is infallible, since in inductive reasoning, the premises of an argument may support a conclusion, but do not ensure it, and similarly, in deductive reasoning, an argument is dependent on the truth of its premises. That is, a false premise may lead to a false result and inconclusive premises also will yield an inconclusive conclusion. The limits of the argument behind "all swans are white" is exposed—it merely is based on the limits of experience (e.g., that every swan one has seen, heard, or read about is white). The point of this metaphor is that all known swans were white until the discovery of black swans in Australia. Hume's attack against induction and causation is based primarily on the limits of everyday experience and so too, the limitations of scientific knowledge. Mathematics professor David Aldous argued that "Taleb is sensible (going on prescient) in his discussion of financial markets and in some of his general philosophical thought, but tends toward irrelevance or ridiculous exaggeration otherwise." Gregg Easterbrook wrote a critical review of The Black Swan in the New York Times to which Taleb replied with a list of logical errors, blaming Easterbrook for not having read the book. Giles Foden, writing for The Guardian in 2007, described the book as insightful, but facetiously written, saying that Nassim's "dumbed-down" style was a central problem, especially in comparison to Taleb's Fooled by Randomness. The Nobel Prize–winning psychologist Daniel Kahneman wrote "The Black Swan changed my view of how the world works" and explains the influence in his 2011 book Thinking, Fast and Slow. Since being published in 2007, as of February 2011 it has sold close to three million copies. It spent 36 weeks on the New York Times Bestseller list; 17 as hardcover and 19 weeks as paperback. It was published in 32 languages. ^ "Taleb Outsells Greenspan as Black Swan Gives Worst Turbulence". Bloomberg. March 27, 2008. ^ Taleb, Nassim Nicholas (15 November 2016). "Incerto: Fooled by Randomness The Black Swan The Bed of Procrustes Antifragile". Random House Trade Paperbacks. Retrieved 5 November 2017 – via Amazon. ^ Taleb 2007 PROLOGUE p.xxviii. ^ Taleb 2007 PROLOGUE p.xxvii, Taleb call this human tendency the narrative fallacy: we seem to enjoy stories, and we seem to want to remember stories for their own sake. ^ Taleb 2007 PROLOGUE p8. ^ Puhvel, J. (1984). "The Origin of Etruscan tusna ("Swan")". The American Journal of Philology. 105 (2): 209. doi:10.2307/294875. JSTOR 294875. ^ Taleb, Nassim Nicholas. "Opacity: What We Do Not See". Fooledbyrandomness.com. Retrieved 2010-10-01. ^ Easterbrook, Gregg (April 22, 2007). "Possibly Maybe". The New York Times. ^ Nassim Nicholas Taleb. "Abbreviated List of Factual and Logical Mistakes in Gregg Easterbrook's Review of The Black Swan in The New York Times" (PDF). Fooledbyrandomness.com. Retrieved 5 November 2017. ^ Foden, Giles (12 May 2007). "Stuck in Mediocristan". The Guardian. Retrieved 7 January 2015. ^ "Charlie Rose Talks to Nassim Taleb". Bloomberg.com. 24 February 2011. Retrieved 5 November 2017. ^ Taleb, Nassim Nicholas (11 May 2010). "The Black Swan: Second Edition: The Impact of the Highly Improbable: With a new section: "On Robustness and Fragility"". Random House Trade Paperbacks. Retrieved 5 November 2017 – via Amazon. ^ The Black Swan was dedicated to Mandelbrot. ^ Taleb, Nassim Nicholas (1 November 2010). "Benoît Mandelbrot". Time. Retrieved 5 November 2017. Slideshow lecture explaining the Ludic Fallacy with clarity By Peter Taylor of Oxford University. Nassim Taleb podcast interview on The Black Swan. Will Davies (2007) 'All in a Flap: Beware of Unknown Unknowns', review of The Black Swan in the Oxonian Review.